Walking is one of the best ways to move and get fit. It is our most natural form of exercise. Research has shown that walking 10,000 steps a day improves our metabolic fitness. This week’s post was inspired by a newspaper article from the Otago Daily Times, 5-6 October 2002. Whilst the article is 13 years old, the advice is still relevant today. The 10,000 steps to getting fit relates to the practical use of a pedometer to track how far we walk each day. I recall attending a conference in the late 1990s where Gary Egger presented research evidence on the benefits of walking in the prevention of chronic disease, and to assist weight loss. It was recommended that we walk a minimum of 7,500 steps per day, with additional health benefits coming from 10,000 steps. Having been motivated to track whether I completed 10,000 steps per day, I bought a pedometer. At the time I was living on a rural property and taking care of four horses. To my amazement I completed 10,000 steps prior to going to work each day. My 10,000 steps came from walking around the property checking on the horses and inspecting the fence lines. 10,000 steps approximately equate to 6.4 km—this depends upon the length of your walking stride. The best way to take 10,000 steps is to incorporate as much walking into your day as possible. Think of opportunities during the day where you can take a few more steps. Walk whenever possible—for work, school and shopping. If you take public transport or drive, consider building in a 20 to 30 minute walk into your itinerary. 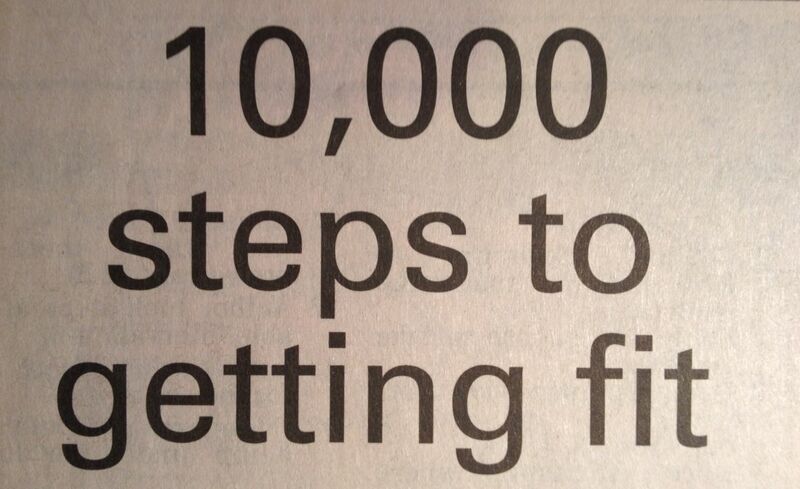 If you do this twice each day, then you will be close to your 10,000 steps. If your job includes a lot of sitting, program a break every 30 minutes to take a short walk around the office, home or outdoors. This can be easily set on a timer or programmed into your phone or computer. Incorporate a short walk into your lunch break. Ideally venture out into a local park or waterway for some fresh air. It will also clear your mind. Take the long route into the shopping centre and walk up every isle in the supermarket—makes sure you only buy the items on your list though! Get into the routine of parking your car in the park that is the furthest from your destination, rather than the one that is the closest. Take a short walk before or after your evening meal. Take the stairs or ramp instead of the escalator or lift. Take a walk whilst talking on your mobile or cordless phone. If you relax in front of the TV of an evening, programme movement breaks during the advertisements or between shows. Incidental activity such as vacuuming, general tidying up the house, sweeping, mowing the lawn and putting out the rubbish all count. For high tech options consider a treadmill workstation or a treadmill at home. Bush and beach walks are great social activities. Consider adventurous or relaxing walks on your weekends, and share the experience with family and friends. There also walking clubs that you can join. Try walking mindfully—this builds fitness for your mind and body. Getting 10,000 steps a day needn’t be an additional commitment. Whenever possible, incorporate walking into your daily routine. I like to think of walking as a form of transport. It is the greenest and cheapest form of transport possible, and it’s good for you. I would love to hear how you get your 10,000 steps a day.